True enough, but incomplete. The lies and predations of the power elite have given voters ample reason to be angry. Almost every major institution in American society, including government and big business, has failed in some fundamental ways. That so many voters have gravitated toward a bigoted, egomaniacal liar like Trump points us toward another failed institution with which Kristof is intimately familiar: the nation’s newsrooms. I know this terrain, too, as a longtime journalist—and, more recently, as someone who’s trying to help people navigate the flood of information and misinformation in a digital world. And I’m not talking here (for the most part) about the Rush Limbaugh-led radio cadre, more recently joined by Fox News and a host of right-wing websites that can be counted on to spew fear and loathing. Their role has been corrosive enough, but at least they’re not pretending to be fair or balanced. No, I’m talking more about the traditional media organizations—newspapers and local TV news in particular—that have spectacularly failed to do their jobs in recent decades. They, too, have contributed to the accelerating meltdown of societal norms. They’ve been outright complicit in creating the current political environment. When news organizations haven’t been obsessed with celebrities—Trump was an expert celebrity before moving into politics—they’ve catered to fear. When their coverage of politics and policy hasn’t been about who’s winning and losing, it’s been stenography, writing down the words of the powerful and quoting “two sides” in a story even when one is lying. And nuance? What’s that? For the most part, local TV news would need a huge upgrade just to achieve mediocrity. But its willful badness deserves special mention, and no small amount of contempt. It’s been years since local stations made any pretense of serving the public trust. Sure, they provide the services of the weather report and sports scores, along with some infotainment—mostly celebrity voyeurism—and, occasionally, the kind of news and information their communities truly need. But by and large, the old cliché about local news’ obsession with murder and mayhem is still accurate: “If it bleeds it leads.” On a recent visit to Phoenix, I watched an early-morning news show that went from one crime story to another. Oh, there was a fire, too. Crime-infested local news programming has continued even in an era of plummeting crime rates in America. And so, over the past 20-plus years, the local news helped feed a tough-on-crime atmosphere that stripped away crucial civil liberties—including most of our Fourth Amendment protection against unreasonable searches and seizures—and kept other serious issues off the air. Network and news-channel journalism has devolved, meanwhile. Terrorism, far less likely to affect an average citizen than domestic crime, has become all too much the focus. After the shootings in San Bernardino, CNN adopted coverage that could be called “all fear, all the time” (my expression, not theirs). When I could stomach tuning in, I saw segment after segment that made a foul-enough crime sound like an attack for the ages, presaging truly mass jihadist carnage on our streets. Even Kristof’s Times, normally the finest of our journalism institutions, has jumped aboard the Be Afraid bandwagon. The newspaper invited its readers to write in about how much they feared being targeted in a mass shooting, and never mentioned in the subsequent story the extreme unlikelihood of this happening to any individual. The Donald Trumps of our culture couldn’t have asked for a better climate in which to wage war on the political establishment, immigrants, Muslims, and truth. Our media lap it up, handing the demagogues the megaphones; they drive ratings and mouse clicks. Journalists are having qualms, at least. In the past few months, there has been quite a bit of “what should we do about Trump?” conversation in public and private settings. At some level, journalists recognize that they can’t—or at least shouldn’t—sit still as Trump and other candidates lie and pitch the kinds of authoritarian “solutions” that would lead to drastic curbs on liberty. The right response, however, would take most political reporters and editors out of their comfort zones, where they profess what my friend, the press critic and reviewer Jay Rosen, calls the “view from nowhere”—being above it all, and opting not to know or care who’s telling the truth. Reporters behave as if they have an absurd obligation to let politicians attack fundamental liberties, without which robust journalism can’t exist in the first place, without pushing back. Issues such as freedom of expression, freedom to associate, and more are in jeopardy in an era of pervasive surveillance and increasingly centralized control of technology and communications. If they want to keep their jobs, journalists have to be activists on these very issues, and shouldn’t call themselves journalists if they don’t. 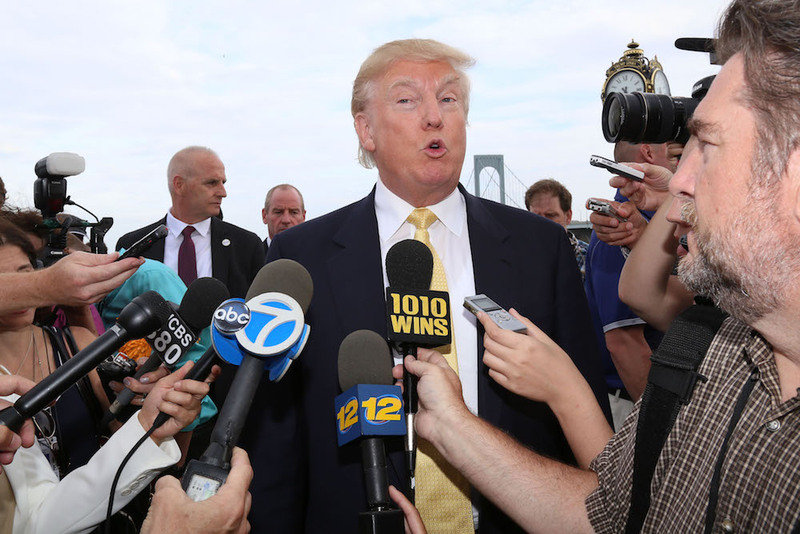 So what should journalists do about Trump? They should do their jobs. Dan Gillmor is professor of practice at the Walter Cronkite School of Journalism and Mass Communication at Arizona State University. He is a regular columnist for Slate’s Future Tense channel, and the author of books on the media. *Photo by Greg Allen/Invision/AP Photo.